Yellingham Farm is a beautiful, unspoilt, small working farm in the heart of East Devon. The farmhouse is Grade II listed and dates back to the 16th century. It provides excellent spacious bed and breakfast accommodation and showcases a fabulous balance of traditional country meets modern makeover. From the moment you arrive, we like to make our guests feel right at home and what better way to begin an authentic Devon retreat than with a traditional Devon cream tea. The Cow Shippon twin room is cosy, yet spacious with wonderful beams, a sofa to relax on, an ensuite bathroom with a bath and shower over. The room, formerly a hay loft comes complete with a beverage tray, homemade biscuits and fresh flowers from the garden. 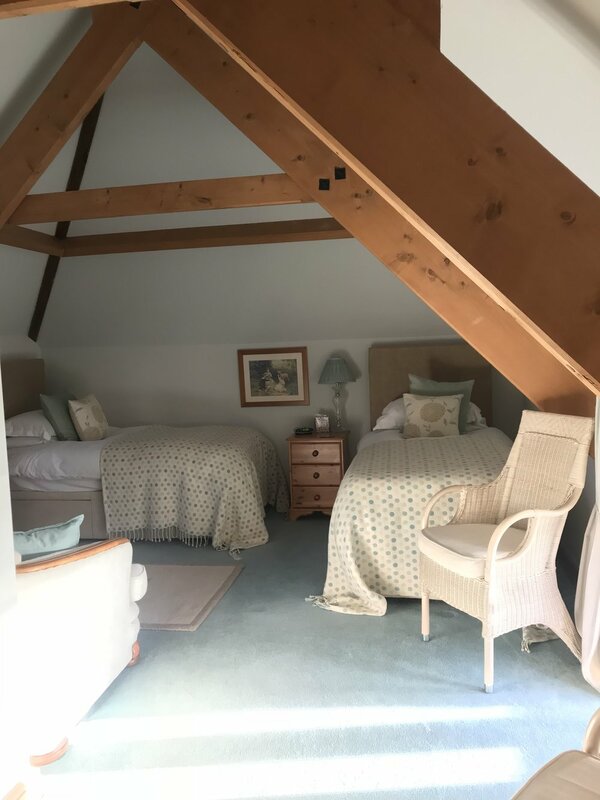 The Cow Shippon double room is framed by a beautiful open beamed ceiling complimented by an ensuite bathroom with a shower. The room facilities include a beverage tray, homemade biscuits and fresh flowers from the garden. The farmhouse double is a large room with lovely armchairs overlooking the farmyard. The ensuite bathroom is spacious with a separate bath and shower. The room facilities include a beverage tray, homemade biscuits and fresh flowers from the garden. Yellingham Farm is a working Devon farm and is bordered by the river Tale which captures the magic of the countryside – Jacob sheep, cows and calves, free range chickens and working sheep dogs – an ideal bed and breakfast location in the heart of East Devon, but within easy reach of Exeter and the famous Jurassic coastline. The farmhouse is set in amongst some 45 acres of rolling Devon countryside and is primarily grassland complete with old and traditional Devon farm buildings, beautiful gardens, an orchard and lovely areas to walk. We cater for every type of food preference you may have and our breakfast menu demonstrates our passion for cooking, delivering imaginative dishes, but most importantly using locally produced ingredients. Our ingredients are produced on our own farm, or direct from local farms, shops and farmers markets. Our menu now changes seasonally and reflects the growing emphasis on healthy eating, for example, we offer a speciality fish dish every morning as well as a vegetarian and vegan options. In the autumn we also make fresh apple juice from apples picked in our own orchard. Our guests share a large farmhouse table, laid daily with fresh flowers and linen.